Homegirl mentioned in Akron Beacon Journal article. "Hudson’s Homegirl is going global. Gina Bishop, who has earned a local following for her periodic Homegirl barn sales, is coming out with her own home decor line. Bishop is working with a company based in China that will produce the products and distribute them to retailers internationally. She said the line includes items such as accent pillows, throws, wall decor and other decorative accessories, all with a handcrafted feel. Most will be manufactured in India, except for a few higher-priced pieces she will make herself. Eventually she hopes to have some of her products made in the United States, she said. The line is scheduled for launch next spring, although she hopes to have some of the products available at her next barn sale, June 5 to 7 at 2357 Hudson-Aurora Road. (Hours are 6 to 8 p.m. June 5 and 10 a.m. to 2 p.m. June 6 and 7.) She also plans to sell the items at the Country Living Fair from Sept. 12 to 14 in Columbus". 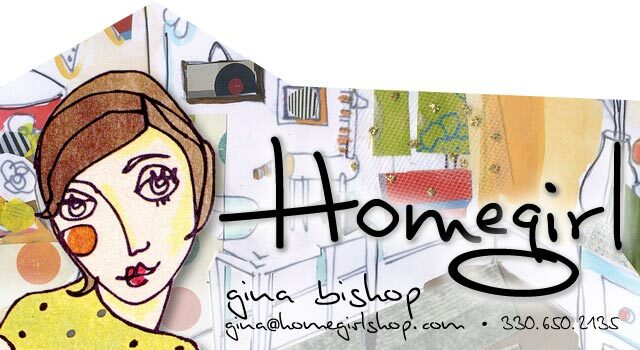 Click here for full article on Homegirl Product Line.